While you are working in Outlook you can access some selected InLoox features via the Start tab. This allows you to further use specific Outlook elements in InLoox. The following InLoox icons are always available on the start tab regardless if you are working in your Outlook inbox, calendar or address-book. 1. Select an e-mail from your Outlook inbox. 2. In the Ribbon on the Home tab click on the Create task button. Afterwards select a project from the dropdown-list (create project related-task) or select Create free task (personal task). Name: By default the subject of the e-mail used for the task name. If wished, you can rename the task. Description: By default this area contains the original e-mail content. You can change the description, add important information or format the text for a better clarity. Effort: Here you enter the estimated effort in work days, hours or minutes. Resource: By clicking on the small arrow you can add one of the recent used resources. By clicking on the three points next to the arrow you can choose a resource from your contacts. Start and End: Add start and end date and time for the task. Documents (only personal tasks): If you are creating a free (personal task) you can link to already existing documents or you can add a new item. 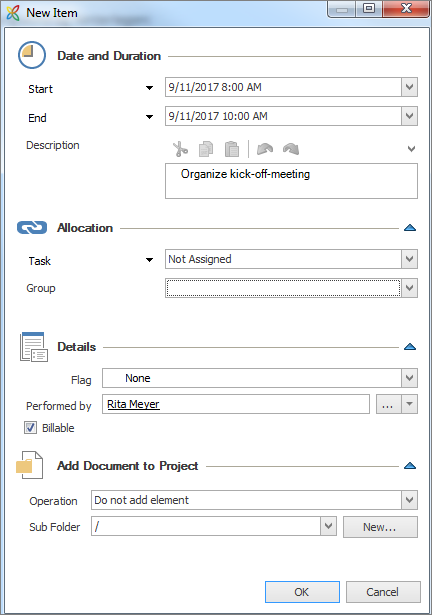 Add document to project (only project-related tasks): If you are creating a project-related task you can decide in the operation area whether you want to add documents to your project or not. Therefore, you can choose from the following options: Do not add element, Element including attachments, Element without attachments, Attachments only or Element and attachments separately. In the Sub Folder area you can add the document(s) to an already existing sub folder or create a new one. Notifications (only project-related tasks): If you are creating a project-related task you have to possibility to notify one or more resources via e-mail about the new task. 4. Additionally, you can switch to the Comments tab where you can add further information. After adding all important information to the task, click on OK to save the task. A small note at your e-mail will indicate that you are using this e-mail as an InLoox element. 2. Click on Track Time in the Start tab. In the dropdown-list select the project where you want to store the time tracking entry. Moreover you can decide whether you want to assign the time tracking entry to a specific task or activity of the project (use the small arrow next to task for changing between task and activity). You can also select a group (design, production, consulting) for the entry. Groups can be created in the InLoox options by any InLoox admin. 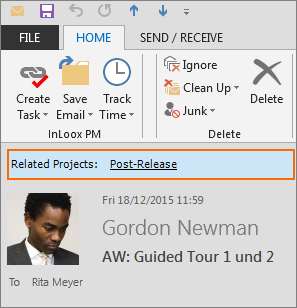 InLoox allows you to quickly assign e-mails to the document storage of a project – directly from your Outlook inbox. A reference will indicate to which project the e-mail has been assigned. 1. Select the e-mail in your Outlook inbox. 2. In the ribbon on the Home tab click on Save Email. Afterwards select from the dropdown-list the project where you want to save the e-mail. Operation: Decide how you want to save the e-mail as a document: Element including attachments, Element without attachments, Attachments only or Element and attachments separately. Subfolder: You can save the e-mail in a subfolder of your project. If there is no suitable subfolder for the e-mail yet, you can create a new subfolder directly in the dialog. Status: You can also assign a status to the e-mail or add a new note for other team members. Links: Create a link to a project element in the mind maps, tasks, planning or time tracking section. 4. When you have finished click on OK and the e-mail will be saved a document of the selected project. Double click on the e-mail in your inbox and a reference will indicate that it has been assigned to a project. 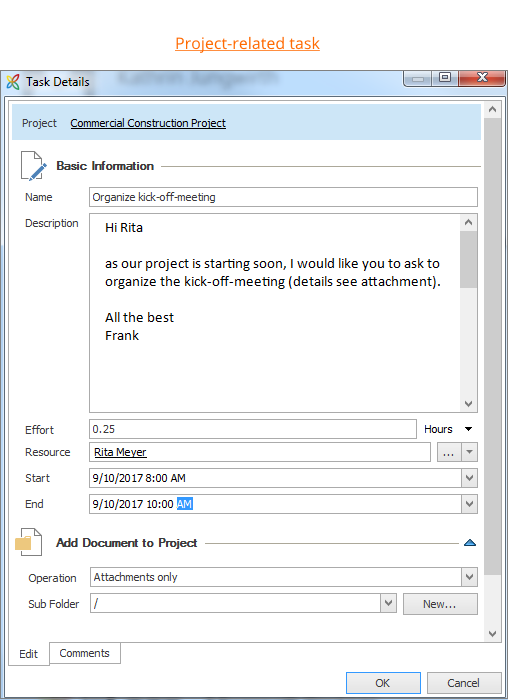 If the assigned email was addressed to several recipients, each of them sees to which project this email has been assigned. 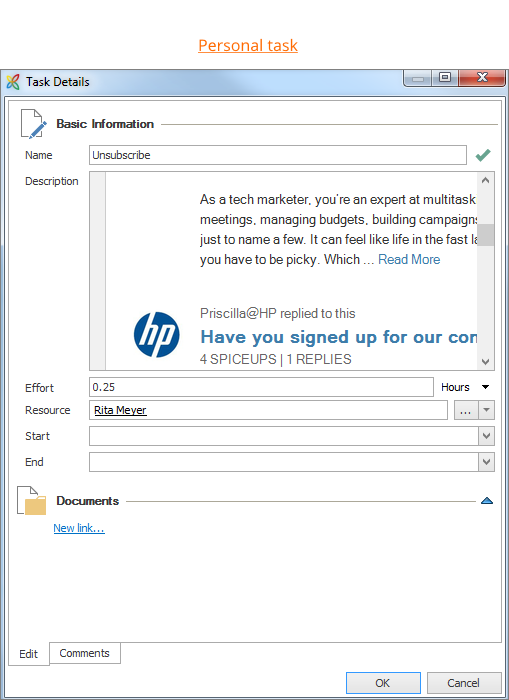 This prevents duplicating the email as a project-document. For this to work, the recipients have to be working on the same InLoox database. InLoox PM assigns the email and the attachment in file form to a project. (Outlook does the same). Email and attachment are stored together. The document list shows whether the element is carrying an attachment but no details of the attachment, such as name or type. InLoox assigns only the email to the project. All attachments will be removed. Attachments can neither be displayed nor saved in InLoox PM. InLoox PM assigns only the attachment to the project. The email is discarded. Correspondence (including notes) can neither be read nor saved in InLoox PM. Correspondence is kept. Attachments can be seen in the document list with name and type. Relationship between correspondence and attachments is lost. How to use e-mails in InLoox 9 for Outlook • Copyright 1999-2019 © InLoox, Inc. All rights reserved.